Vegas, baby! Nektan is here once again to provide you with a big, colourful gaming bonanza with a stack of great games from tons of different developers and publishers. The deals here can change from time to time, but current Vegas Baby bonus codes really have new players – and those seasoned gamers out there, talking. Get down to Vegas Baby today to enjoy the huge welcome bonus and great games available! We’ll take a close look at the opening offers here, but it’s also important for us that we offer you a comprehensive breakdown of what you’re set to expect from the games catalogue, regular deals, terms and conditions and mobile play. Never judge a site by its opening deals, that could be a fatal decision! This is one of Nektan’s biggest and brightest online casino standards, colourful and appealing and flexible across a variety of platforms. There are plenty of reasons why this site has retained a core following since its launch in 2017; it’s thanks to its outward appeal, its large developer partnership, and its focus on big deals and portable play. Nektan is a well-known gaming network provider and, as such, it’s hardly surprising to see the brand continuing to expand and to boost its repertoire with the help of some truly brilliant developers. See our Go Win Casino review for another similar brand. With around 200 slot games, and with over 50 different casino standards to get into – including live options, there’s more than enough choice here to warrant signing up. Without further ado, however, let’s look at our Vegas Baby Casino review and the promo codes awaiting you as a new customer. While there may not be a Vegas Baby Casino no deposit bonus in play at the moment, what there is remains very attractive to new players, a welcome bonus worth up to £500, providing you stake enough of your own money in the bargain. This type of welcome deal is fairly common across sites of this nature, such as the Cheeky Riches site, and while it may not be a unique setup, what it does offer is plenty of opportunity for you to make your cash travel that little bit further. Much of the deal is based on cash matching, but there is a nice little free spins bonus nestled in here too. 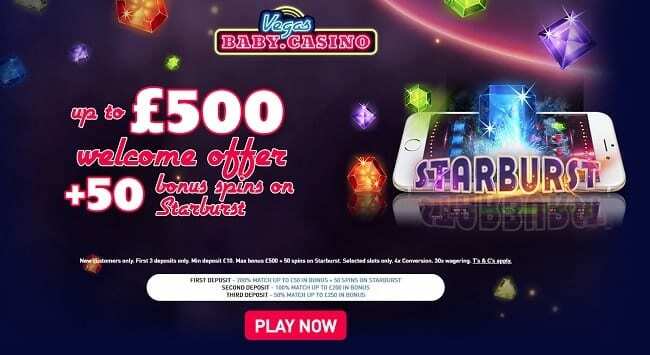 On your first deposit, match 200% in cash up to £50 and claim 50 free spins on the brilliant Starburst game, an old favourite and one which is likely going to be here to stay – and then claim a further 100% match on anything up to £200 on your second payment in. Stick around for a third deposit and you’ll be able to claim a 50% match bonus on anything up to £250. All in all, that’s up to £500 in free bonus credit waiting for you in April 2019, providing, of course, you have the cash to put in! For seasoned players and those with plenty of gaming money to spare, this is a deal that could be well worth looking into. You’re going to need to make sure that you pay in at least £10 on each deposit, too. Do also be aware that, as standard, wagering requirements will apply. In terms of the free bonus spins on Starburst, you’ll receive 50 spins weighted at 10p each, and any winnings will be transferred to you in the form of bonus cash. You’ll need to wager back 30x the bonus you’ve earned if you wish to cash out. On the rest of the opening deal, 30x will apply again, though you’ll need to take into account both your deposit amount and the bonus you receive. Bonus funds will be available for up to 28 days, and there are stacks of games you can use them on, but anything such as roulette or blackjack will be excluded from wagering rules. The site offers regular deals and Vegas Baby bonus codes to players who come back and play regularly – so if you are on the lookout for a new site to try out, this may well be your lucky day if you’re aiming to get something back. Wagering terms and conditions are fairly competitive when looking at the bigger picture elsewhere, we really think you could do a lot worse. The platform is bolstered by an amazing array of software developers and, as such, the variety of games here is fantastic. While there are sites out there with a greater quantity of games, there is a varied cross-section here which we think will appeal to casual and seasoned players alike. From brands such as James Dean, Guns ‘n’ Roses and Jimi Hendrix to the likes of Paws of Fury, Wolf Run, Thunderstruck II and more besides, the slots catalogue is absolutely brimming – and we think that there are just enough casino favourites here to keep those looking for the authentic online Vegas appeal happy and ticking over. There are live games available, too, which help players to feel like they are more involved in the action, while all the game titles here are verified to be fair and above board, live casino tables can feel a little fairer, which perhaps explains why they are immensely popular right now! Do take a closer look at the games catalogue and take your pick, there’s plenty to choose from. Where do we start on software in our Vegas Baby Casino review? There are absolutely stacks of major players involved here, and we will list them all for you in our essential site facts, but the cream of the crop are arguably the likes of NextGen, Microgaming, NetEnt, IGT, Elk Studios and Nektan themselves – Nektan’s network of sites really do pull together some talented names, and some features which are well-regarded and well-loved by players of all calibres! Check out our review of Casino Disco to see what we thought of another great site. The site’s software is largely run through Nektan’s own standards, which is traditionally very sleek, very speedy, and very responsive. We will cover mobile play in a little more detail below, but all in all, things are very accessible and we experienced no problems when getting started. To make a withdrawal, you are going to need to have at least £20 in real cash available after wagering. You can take out up to £2,000 per day (or £5,000 per month), and you’ll need to wait for around three days for your request to be finalised. This time may well be extended if you are withdrawing to a card, we always recommend withdrawing to an e-wallet or online service wherever possible if you’re aiming to cash out sooner rather than later. Nektan always gets mobile compatibility right and it’s therefore no surprise to us that the Vegas Baby Casino mobile experience is so easy to get into via phone and tablet. There may not be an official app available for you to download just yet, but all you need do right now is navigate straight to the main site, use your Vegas Baby login to get into your account and start playing all of the site’s best games on a flexible, responsive basis. The games here are all optimised, even the live casino standards, meaning that there’s no longer a worry about missing out if you’re focused on moving to mobile play. This is a big plus point for our review if you like gaming on the go. Another brand with great mobile features is the Supernova Casino site which we have also reviewed. So what’s the verdict on our Vegas Baby Casino review for April 2019? Despite one or two terms which some gamers may find restrictive, it’s a gaming site with plenty of charm, lots of variety and a great deal to get involved with. Appealing to casual players and those who may be looking for something a little different, this is a site which is well worth signing up for on the basis of the Vegas Baby bonus codes alone, this isn’t something we generally advise! Take a look – and get stuck in via mobile or PC.